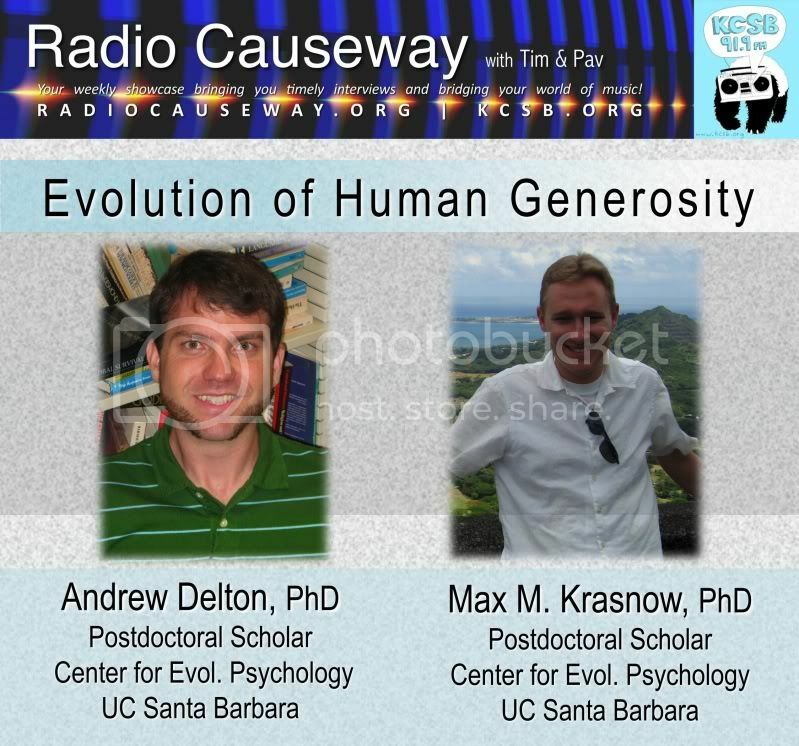 This week's Radio Causeway will be examining human generosity and it's evolution with Post Docatoral Scholars from the Center for Evolutionary Psychology at UC Santa Barbara, Andrew W. Delton and Max M. Krasnow. Drs. Delton and Krasnow are the lead authors of a new paper published with in the Proceedings of the National Academy of Sciences titled, "Evolution of direct reciprocity under uncertainty can explain human generosity in one-shot encounters." Krasnow and Delton co-authored the paper with Leda Cosmides, professor of psychology and co-director of the Center for Evolutionary Psychology; and John Tooby, professor of anthropology and also co-director of the Center for Evolutionary Psychology. The Yeah! Free Music! pick of the week is "Rainy Day" from the French surreal experimentalist, Chenard Walcker. Great and alive show. Kudos!